Baby Needs and Diaper Drive! Starts next week! 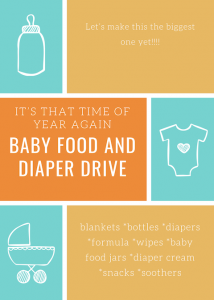 Annual Community Baby Needs Drive! Drop off your donations at any classes from November 15th- December 18th! All donations will be shared with the various community needs within Hamilton!